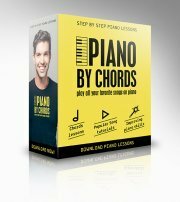 I've been working hard to offer you a collection of popular and classical printable piano sheet music for beginners. Learning to play the piano is much easier with these easy piano sheet music. In time this free piano sheet music collection will grow so if you're eager to find new pieces just visit once in a while. Click here if you haven't signed toPiano Playground, our free E-zine yet. Make sure you do that in order to get the username and password codes for the piano sheets and tabs we provide for each piano tutorial and lesson (And I'll keep you posted with the new piano lessons and videos on our site).